While you might not think of your auto attendant very often, it's a crucial factor for your business. First impressions matter and anyone calling into your organization is greeted by that auto attendant you rarely remember. 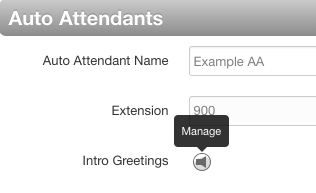 Intro greetings are a new feature to help make your auto attendant message easier to manage. Maybe you want to wish your clients happy holidays, or let them know you have an awesome promotion going on; either way, intro greetings make customizing your auto attendant easier than ever. Instead of recording an entirely new message, you can upload or record a brief intro to your already-existing auto attendant. Like all greetings, you have the option to upload an audio file (.wav or .mp3) or record a message through a Versature device. Follow the steps below to learn how to add an auto attendant intro. NOTE: You must already have a time frame in place to use for your new auto attendant intro greeting. 1. Log in to the SONAR portal and ensure you are in “Manage Organization” view. 2. Go to the Auto Attendant tab. 3. Click the name of the auto attendant to which you want to add the intro greeting. 4. Click the speaker icon next to "Intro Greetings." 5. Click Add Greeting at the bottom of the pop-up window. 1. Enter the extension number for the device you want to record the greeting. 2. Select a time frame. 3. Click call and follow the voice prompts. 1. Click browse and find the recording you want to use as your intro greeting. Once you’re brought back to the original pop-up window, you can see the new greeting in the list, indicating your intro has been successfully saved. You can exit out of the window or click Done. Set a “happy holiday” to play before your auto attendant from December 1 to January 2. Use an intro greeting to let people know if your hours of business are changing. Always inform people if their call is going to be recorded for legal or quality assurance purposes.